It seems like new CTO John Carmack and the Oculus Rift team are seeing more competition thanks to the Kickstarter augmented reality headset and Sony's own third-gen set. But Carmack doesn't seem too worried in an interview with Engadget, and instead dropped more details about the upcoming virtual reality set. Right now, the Oculus Rift must stay hooked up to a PC to function but Carmack says a standalone headset is ideal, and possible thanks to the mobile industry which is what he calls a "freight train of innovation" where he and the team are just "hitching a ride along." Carmack believes a standalone Oculus Rift headset running on Android, powered by a system-on-a-chip would untether your head from the PC, much like how the systems in a mobile device work. However on a Rift, it would run at a tenth of the power of your computer so he says initially only "modest experiences" could be had, like watching movies and participating in virtual reality chats. Playing graphically demanding games would of course, require much better hardware which currently isn't possible to compress for a decent headset. 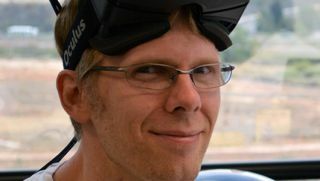 Though Carmack believes heading towards wireless virtual reality makes the most sense as it's "unencumbered, and it does make a difference not having a wire dragging along your shoulder." Though a wireless Oculus Rift is probably five years away, consumers can expect to see the headset next year, after another developer kit is released first. Carmack says the next dev kit should have higher resolution and better position tracking, both of which the team is constantly working to enhance; positional, and optical tracking, are vital to improve so users won't get too sick using the device. The CTO also hinted that he is currently working on a secret Oculus project, presumably about "core technology" but he remained coy and stated it's something he "can't talk about right now." Console vs. PC gaming: which is better?